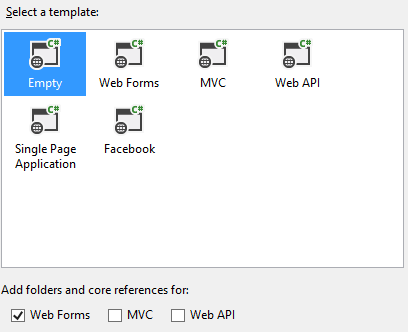 An existing Web Forms project wants to use MVC for new modules / functionality. The new modules are totally independent from the existing Web Forms. The former case is quite straightforward. All you need to do is add new MVC controllers to the same Web Forms project and add a few lines of code in the Global.asax as suggested by the readme file generated by the Scaffolding dialog. The second case, however, requires some thought. 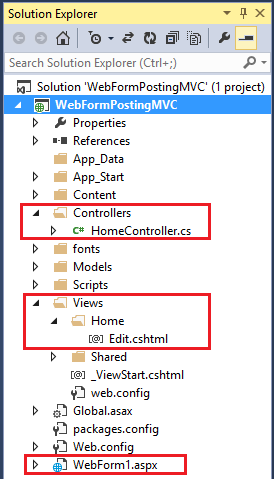 The remainder of this article illustrates how Web Forms can send data to MVC controllers. Let's see how this can be accomplished using "One ASP.NET" of Visual Studio 2013. Begin by creating a new ASP.NET project based on the Empty project template and check the "Web Forms" checkbox under "Add folder and core references for". This will create a new project targeted at Web Forms development. Then add a new Web Form - WebForm1.aspx - in the project. Add a GridView control on the Web Form and configure it to show CustomerID, CompanyName, ContactName and Country columns of the Northwind database. You can either use SQL Data Source control or Entity Framework to deal with the database operations. Then add a TemplateField to the GridView. Place a Button server control inside this template and set its PostBackUrl property to /home/edit. The following markup shows this TemplateField. The PostBackUrl of the Button control specifies a server side resource to which the form will be submitted when the button under consideration is clicked. In this case you set the PostBackUrl to an MVC action method named edit residing in the Home controller. You will add this controller and its action in a minute. Then add a HiddenField server control below the GridView. You can't submit the GridView data to the MVC controller directly because GridiView is just a table and form submission will carry this data as a part of the ViewState - not easily accessible for our processing. That's why this hidden form field is required. Its value will be set through jQuery code as you will see shortly. 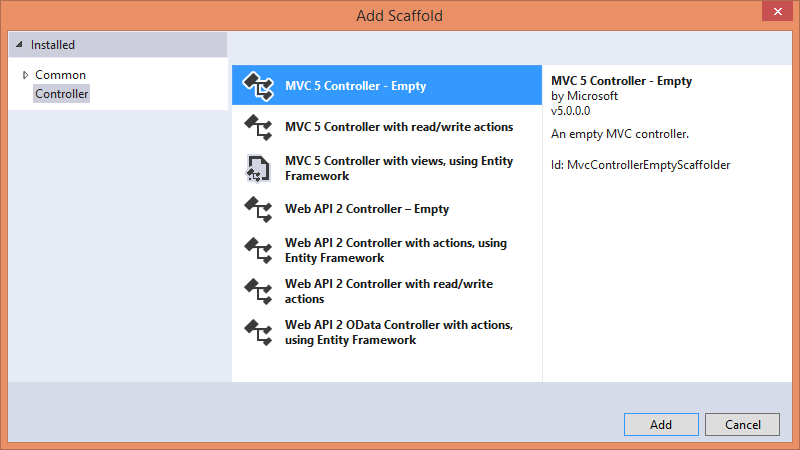 Now, add Controllers folder inside the project, right click on it and add a new MVC controller using Add Scaffold dialog. The Edit view submits its data to the Update() action method and Update() action receives it as a Customer object. Inside, it simply updates an existing Customer and saves the changes to the database. Once the data is updated it redirects the control to WebForm1.aspx and passes the CustomerID in the query string. The WebForm1.aspx can use this query string to display a success message to the user. The Edit view is straightforward and submits its data to the Update action method created earlier. As the final step, add the following code to the Page_Load event handler of WebForm1.aspx. The Page_Load event handler simply checks whether CustomerID has been passed in the query string or not. If CustomerID is available it displays a message in a Label control informing the user about the success of update operation. The following figure shows the final project structure of this application. That's it! Run the Web Form, try clicking on the Edit button of any record and see if the MVC view displays the data for editing purpose. Also, check if clicking on the Update button of the Edit view takes the control back to the Web Form.